Madrid is a big city, the largest we have visited in Spain. Unlike the other largish cities we have visited, it does not seem to have a historic center; the Plaza Mayor is a nice place in daylight, but in the evening it is a haven for the homeless who are sheltering in cardboard boxes left over from the day’s sales of tidbits and trinkets for tourists. The main gathering place for events is the Puerta del Sol, site of the city hall and of Madrid’s civic mascot, the statue of a bear reaching for fruit on a strawberry tree (obviously not the kind of strawberries we grow for shortcake in the US). Unlike other European capitals, it does not have an iconic identifying landmark, like the Eiffel Tower or Big Ben or the Brandenburg Gate or St. Paul’s Cathedral. 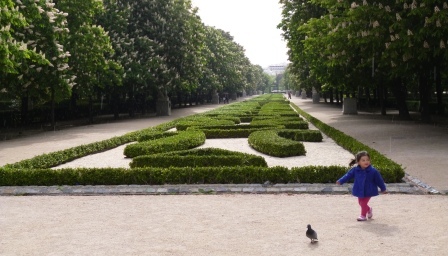 What Madrid has is Art, in three world-class museums, and in Madrid we looked at Art, with an occasional eyeball-break in the lovely Parque del Buen Retiro. which had started two days before our arrival and despite the drizzle the line to get in there was across the plaza when we arrived at 4:30. We decided to do the rest of the museum and come back later for Dali. We worked our way up in the general admission line, and discovered gleefully that as seniors we qualified for free admission to everything but Dali. W had done her prep and started us on the second floor, but even then we wore out our feet and our brains before we got to Guernica. Two days later we came back to the Reina Sophia for a second go-around. This time we let ourselves drown in the overwhelming torrents of Dali and Picasso. These had never been my favorite painters, but after learning of the background against which they lived and painted I am more favorably inclined. I did not know that Guernica had been painted on commission by the republican government of Spain to show at the Spanish pavilion at the 1936 World’s Fair in Paris. I did not know it was part of an attempt to win world sympathy for the republicans in the Civil War against Franco. (They got a lot of sympathy, but Franco still won). And I did not know that during World War II Dali had to flee Spain for France, then for the USA. There he became the first performance artist/career celebrity, perfectly reading the needs of the host country, anticipating Paris Hilton and Madonna by a half-century. After drinking from the fire hydrant of history and art at Reina Sophia, the park was a chance to stretch our legs and our eyes over some longer distances. There is something very refreshingly basic about a vista that includes a little girl and a pigeon. I love the Reina Sofia! 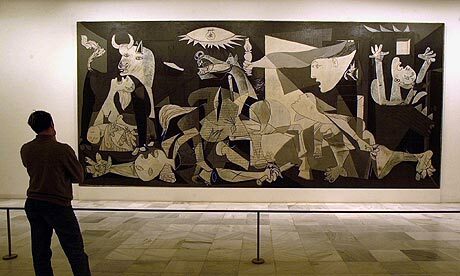 I was surprised at how big Guernica is. I mean, I expected it to be large, but not THAT big!